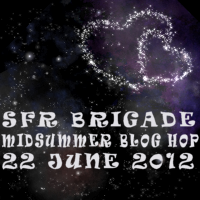 Come one, come all to the SFR Brigade Midsummer Blog Hop! First prize: Winner’s choice of a Kindle or Nook! Second prize: A supernova collection of science fiction romance titles (some restrictions may apply), plus a goodie basket!